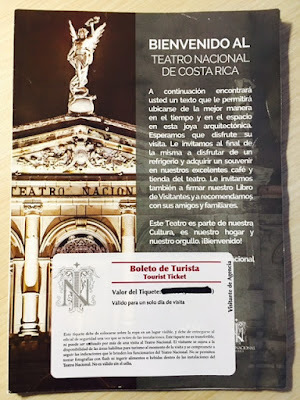 Walking distance from the hotel and situated along the Avenida Central, you can't miss the national theater building. The structure is considered as the country's one of the finest architectural/historical building. It still actively presents highly critical performances and the president comes here at least twice a month. The exterior design is very exquisite and will somehow "invite" you to enter. The entrance fee is 5 USD which also includes free guided tour. The tour guide speaks both English and Spanish but sometimes they perform two separated tours. They do it every hour and the last batch is at 4 in the afternoon. The history of the building is that during 1890s, in the midst of successful coffee export, high society people wanted a place where they can gather together and allow them to enjoy great operas same as to what they had in Europe. So using the export tax money from the coffee, they started the construction of the theater in 1891. But it encountered financial problems so the government decided to impose tax to all citizens in order to complete building it. In 1897, the theater was opened and inaugurated with the opera 'Faust' by Charles Gounod. The tour guide mentioned that most of the structures are gold plated so the security in the building is very strict. You will see lavish furniture and beautifully designed chandeliers and light effects. There is one very specialy bleacher place for the president and he can only use it unless he authorized it to be used by others. The theater floor can also be lifted up to be same level of the stage and this is being done manually. Beautiful paintings also surround the entire building. Most of it are created by famous Italian artists. One of the most popular is the one on the ceiling named 'Alegorio del Cafe y El Banano' by Aleardo Villa. It is considered as one of the '10 greatest ceilings in the world'. The painter haven't visited Costa Rica when he painted it so he had multiple technical errors. One error is the way the banana was handled and the second is the concept that there is no coffee harvesting near the Caribbean. 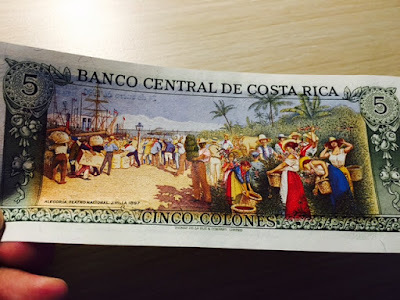 The painting was once in their cinco colones bill but is now out of circulation. Luckily, a very nice Costa Rican woman gave me one of her collections. During the break of the performances, there is an area where people can gather and talk about anything. But during the old times, women and men are separated into two halls. 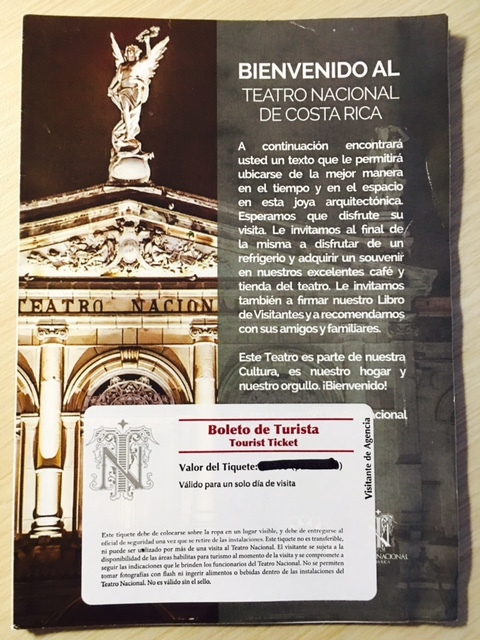 Overall, the theater is very beautiful so you cannot miss this once you are in San Jose, Costa Rica.